I think we can all agree that there are fantastic benefits to any of the air mattress beds discussed. Who can argue with the added comfort these things provide on camping and hiking trips? Who wouldn’t rest easier on a long road trip in the family mini van or SUV with an air bed in the back? But what about every night at home? 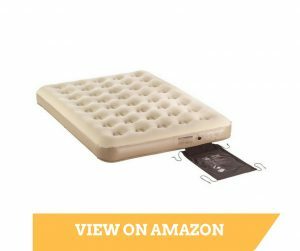 Are air beds suitable for everyday use? It’s important to recognize here that there are air mattresses and then there are air mattresses. The temporary raised or double air mattress you subject your guests to or the Aerobed for kids you bring along when traveling is one thing. In the short term, these are great alternatives to sleeping on the hard floor or on a lumpy old couch that offers little to nothing in the way of back support. But, over the long term, they do leave something to be desired. For everyday use you should consider a permanent, high-end air mattress designed with that purpose in mind such as the SoundAsleep Dream Series Air Mattress. Everyday air mattress beds have a great deal more in design, construction and comfort to offer over their convenient temporary cousins. Unfortunately, they are also notably more expensive. That price tradeoff for full time use is, in my estimation, money well spent for several reasons. A quality everyday air mattress is designed with a frame in mind which helps limit distortions due to weight distribution (think of a balloon in a box). This makes them decidedly friendlier to you tossing-and-turning types who’d otherwise roll off an ordinary air mattress. In addition to better conformity, everyday air mattress beds also improve on comfort. From the more mundane but luxurious addition of mattress pads in any number of thicknesses to the more exotic features of independent firmness adjustment offered in SoundAsleep Dream Series Air Mattress, everyday air mattresses definitely warrant the increased expense over their less ambitious cousins. And one final note – multiple studies seem to support the finding that switching to an air mattress bed for your everyday use could result in dramatic improvements in sleep, quality of sleep and back pain relief. If that doesn’t have you considering switching out that old spring torture device you’ve been enduring for years then you might just be a glutton for punishment. I have already reviewed some of my favorite rollaway beds as well as the best stairway bunk beds. In today’s review, I’d like to shed light onto the best air mattresses for everyday use. We all have those unexpected guests that arrive and we cringe at the thought of having to give up our own bed. With the Aerobed Guest Choice, you don’t have to. The Aerobed Guest Choice Air Bed is as close to a real bed that you will get. The air mattress is awesome for those unexpected guests and even the ones that are expected. It’s also great for sleepovers and slumber parties that your kids may have as well. It’s the perfect thing for when those people come to visit. It saves them the price of an expensive hotel or motel. It’s more comfortable: It puts your guests in a near home environment. This is also a great blow up mattress to take camping with you. It’s almost as comfortable as any bed at home, and I am sure better than a hotel bed. It is compact: It will fit in most tents or in the back of a pickup. Take it with you when traveling and see just how much money you can save in motel bills. It is durable: The Aerobed Guest Choice is made out of a puncture resistant heavy gauge material and a PVC vinyl. There is no doubt it is strong and durable and can withstand a lot of stuff. The velvety material on top of it makes for a wonderful sleep as well. The AC pump that comes with this Aerobed Guest Choice will have the bed inflated in less than 60 seconds. This is great as there is no standing around for hours waiting for the bed to inflate. It’s a pleasure to have it so quick and easy to set up. All too often way too much time is spent trying to set up a blow up mattress. Not the case with this one. It s also just as easy to deflate and takes about 30 seconds. The AC pump is easy to use and is airtight. Coleman makes the best camping air mattresses and again I found a great one from Coleman for car camping, the Coleman SUV Quickbed! With so many ‘best’ air mattress options available in the market, you really have to be careful in choosing what will be best for you. The length of this air mattress is just right to fit most SUVs like Tahoe, Suburban, Xterra, Explorer, Trailblazer, Honda Element, 4Runner, and Dodge Durango. But if you have a shorter space, this air mattress can also be filled up partially because it has separate chambers – one long and one short one. As for the width, it’s more or less like a twin sized bed so it won’t fill up the whole back of the SUV, but it’s wide enough for one adult, and about as comfortable as any air mattress. This air mattress is also great for tent camping because the bottom plastic surface keeps away moisture and dirt while you sleep, and is very easy to wipe clean! You’ll have to buy a manual pump for this air mattress if you haven’t got one already. But that’s not a big deal because you can get one for as little as $10 – $15. Add that to the price of this Coleman Quickbed and it is not even the price of an Aerobed. After I told my friend about this, he bought it, and he has been camping in it ever since. In a summary, this is an affordable, easy to use and clean air mattress that is great for sleeping in an SUV. Wenzel Insta-Bed signifies quality when it comes to inflatable beds and air mattresses. Have you tried using a hand held air pump for over twenty minutes just to inflate your air mattress? If you have, then you are not probably using the Wenzel inflatable bed. The Wenzel is among the most well known queen sized inflatable beds available in the market today. What sets it apart from other brands is that it can be adjusted with ease through its comfort system. Its height, convenience, and comfort are the very features that everybody needs from a portable bed. The Wenzel Insta-Bed is very flexible. You can use it as your temporary sleeping mattress, guest bed for holidays, or for camping trips. Another wonderful quality about the Queen Raised Sure grip is that you can save so much time while using it. Inflating and deflating can transpire in just a few minutes thanks to its built-in pump system. It can inflate the bed to its right size in two to four minutes. Unlike other inflatable mattresses wherein you still have to attach the pump, the Wenzel’s controls can be easily accessed at the bed’s head and are slightly buried in the bed. It also comes with an easy slot for storing the 120V AC plug when you are done inflating it. An apparent benefit of the Wenzel Insta-Bed and its amazing built-in pump is that manual inflation is no longer necessary. You do not need to buy a separate air pump and vehemently use your energy just to inflate the mattress. With the Wenzel bed, all you need to access are two boldly marked controls (Inner chamber and Outer Chamber) for adjusting the dual air chambers. Its inflation and deflation controls make it so easy and fast to fill up the mattress, remove all air and store it thereafter, or add and remove air for adjustments. If it is convenience you are looking for, I recommend you get this everyday use air matrress now. If you have tried other air mattresses only to discover that they are often times overpriced for the type of quality that you receive while using them. Not to mention that they are often uncomfortable while sleeping and leak air very easily, then give the Intex Pillow Rest Queen Airbed a chance. All of these things coupled with the fact that most inflatable air mattresses are not known for being that durable, so if you are going on a lot of camping trips or maybe you are just a bit rougher with your beds when you are sleeping in the middle of the night. What you need in a good air mattress first and foremost is dependability, durability and comfortableness, a comfortableness that would make you feel like you are sleeping on your bed at home. This way you can get that restful night’s sleep that can be so ever precious in maintaining your everyday life style. If you are looking for all of the above features in an inflatable bed, you should really look no further than the Intex Pillow Rest Queen Airbed. 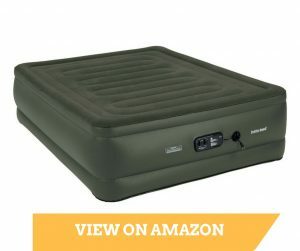 This air mattress bed is one of the most durable airbeds you have ever had the pleasure of sleeping on. Perfect for those with small children who will be climbing and jumping on it or who are a little rougher with their beds. Not to mention that it has a weight limit of six-hundred pounds, making this airbed perfect for couples or letting the kids all sleep on it when they invite their friends for a sleep over. The Intex Raised Downy Airbed is the finest blow up mattress on the market, at least in the opinion of this sleeper. We all need to sleep, right? So, why am I so hyped about this Airbed? Let me share with you my experience. I was an avid camper and had enjoyed camping since my youth. About three years ago I was involved in an accident that had affected my back and neck. The days of camping and sleeping in a backpacking sleeping bag were over. I would never consider the use of a Recreational Vehicle and every camping cot I had tried out left me stiff and sore. I had tried several air mattresses early on in my attempts to remain camping. Although I slept better and my back felt relatively fine the exercise in preparing the airbed and then breaking it down for storage was a hassle and cumbersome. My friend was very persistent. He went as far as to purchase the Intex Raised Downy Airbed as a gift. I accepted the gift but not with the intent to use it for camping. My friend wasn’t having any of it. After constant reminding and badgering on his behalf, I reluctantly agreed to hit the mountains for a weekend camping trip. Stocking up on pain relievers, I packed my normal camping gear and tossed the still boxed inflatable air mattress in the back of my truck. Frankly, this was the first camping trip I set out on feeling agitated and ready for a horrible weekend. I was prepared to spend more time setting up and taking down the airbed then enjoying the outdoors. That evening I was ready to break out the Airbed and begin the arduous task of getting ready to turn-in. 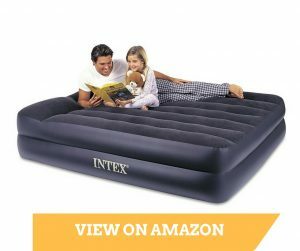 To my surprise the Intex Raised Downy Airbed (with Built-in Electric Pump) was compact and easy to fill. The entire process took minutes and left me amazed at the ease and speed in which I was able to set up. That night, I slept almost as well as I do on my best mattress at home. I woke up relatively pain free, in good spirits and ready to start the day. One thing stood in my way and that was putting the Airbed away. I entered this leg of the try-out with a better attitude after the set-up turned out to be such a breeze. I was not disappointed. The Airbed deflated quickly, folded simply and stored easily. I have used the Intex Raised Downy Airbed for the past year and have been camping three times during this stretch. It is so great o be back in the wilderness either under the stars or in a tent. 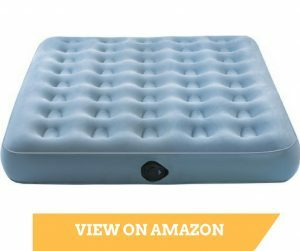 I highly recommend this Airbed for anyone looking for an Airbed no matter your need. 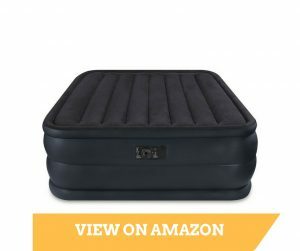 This versatile and multi-use Airbed is sure to fit all needs. Great Airbed, I have never been more pleased with a product before. Are you using it for camping or as a guest bed? Select the size for the air mattress. Just like standard mattresses, air mattress sizes come in twin, queen and king. Most people don’t go for king size because they would be heavier and less portable. There are also air mattresses which are made up of two twin beds that can be connected together or separated as you like. This kind is more versatile to accommodate the number of guests, and is cheaper to get than two separate twin beds. Check out the Coleman 4-in-1 Quickbed. Raised air mattresses give the comfort of being higher from the ground and easier to get into. Raised air mattresses are also called air beds, because they are more like beds when inflated. But they are a bit heavier than the simple air mattress. Would you like a built-in pump? Self-inflatable air mattresses are very convenient because you just have to press a switch or button to inflate the air mattress. If the air mattress doesn’t have a built-in pump, you will either have to blow it up (lung power!) or use an electric pump powered by battery or power outlet. If you’re going to blow it up, get one with a one-way valve. You might want to check how long it takes for the air mattress to inflate and deflate. Deflation time might be important if you use the air mattress somewhere you might have to leave in a hurry. Memory foam – Adds to comfort because it reacts to body heat and molds to the shape of the body. Dual chambers – Some queen and king size air mattresses have dual air chambers so that each person can adjust the firmness on his/her side. Remote control – Adjust the firmness of the air mattress with a remote control. I’d say this is not a necessary feature at all, because you can reach for the switch just as well. Repair kit – Some air mattresses come with a repair kit, for you to repair leaks. Warranty – Check whether your air mattress comes with a warranty. Don’t buy one without a warranty.